The president has announced ‘Title Deed Friday’, a programme that will see title deeds being handed out to recipients every Friday. 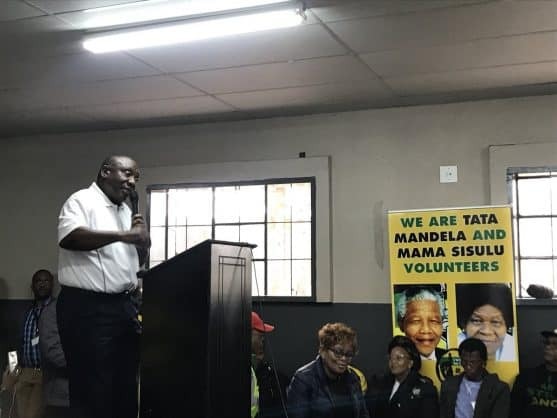 President Cyril Ramaphosa gave away 10 title deeds to elderly Tembisa, Gauteng, residents during the ANC’s election Thuma Mina election campaign today. Speaking at the Moses Molelekwa Arts Centre in Tembisa, Ramaphosa said an estimated half-million title deeds would still be handed out in Gauteng. He committed to ensuring that the title deeds office fast-tracked the process of handing over title deeds to residents in the province. “We should undo the ravages of apartheid,” the president said. He urged title deed holders to desist from selling government-sponsored houses, but rather take pride in owning their homes, which they could pass down to younger generations. He said he supported the rapid release of the land programme, adding he had directed Minister of Human Settlements Nomaindia Mfeketo to devise a new housing policy on housing that would will see the “rapid release” of serviced sites – serviced with roads, sanitation and other basic services – to the people. “The best way to address the housing challenging in Gauteng is to release land rapidly,” Ramaphosa said. The president said the rapid release of the land programme would curb land invasions, which he said should not continue, urging South Africans to acquire land in an orderly fashion. He called on the citizenry, particularly those in need of land and housing, to respect the law, the constitution and their fellow citizens and embark on acquiring land and housing with the support of the government. “We want the government to be an enabling agent,” Ramaphosa said. The president said the government should expropriate land where necessary because that was its role, a process, he said, that would undo apartheid spatial injustices. “We want to repair the spatial injustices of apartheid,” Ramaphosa said. He said people should be placed closer to the cities so they could get services and be nearer to their workplaces. Ramaphosa said through a housing agency, the government will assist people with technical skills, architectural capabilities and capabilities to test the soil if it is conducive to building a house. “Government is going to be standing behind you, and will be supporting you all the time,” the president said. “Maybe we have waited for too long, but now we have to do it rapidly,” Ramaphosa said. The president said he was of the view that handing over title deeds to people would infuse growth in the economy because people would own something they could use as collateral at financial services institutions. “We are restoring assets to our people. There are quite a number of assets that are out there that belong to our people, I want to say, let us respect our assets,” Ramaphosa said. He urged people not to destroy assets such as libraries, hospitals and other government and civic centres when protesting over poor service delivery. Ramaphosa said following today’s handover of title deeds, a programme called ‘Title Deed Friday’ would be kickstarted, which will see people receiving title deeds every Friday. “This is the service delivery we are talking about,” the president said.